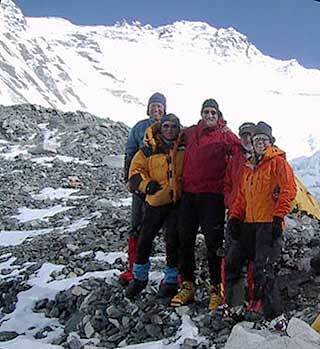 Okay, I’m calling you from Camp 3  a familiar site to us now. We’ve returned, the entire team. Our tent arrangement is identical to what it was before. Maegan, Garry and I are in one tent. Brad and David are right next door. Quite different scene this time, however. The thing that’s different is that everyone here, including Maegan who had such a bad headache last time, looks 100 percent better. It does work that way when you come back to altitude. Your body’s much more adapted. We came up the fixed lines better and we’re doing great in terms of acclimatization. But also, the scene looks very different because we’re inside tents with 20 to 30 knot winds probably, gusting to 40 outside. We’re hunkered down now, trying to get some liquids. 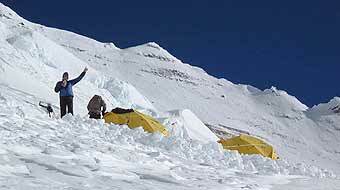 Wind is about all we know about at Camp 3 right now. The wind is so strong that when we need to communicate to Dave and Brad next door in the next tent, we use the radios. 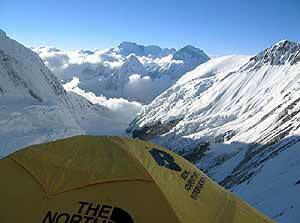 I think a lot of people have heard stories about the South Col and other places on Everest. They’re always puzzled when they can’t understand why it’s so hard to communicate tent to tent. 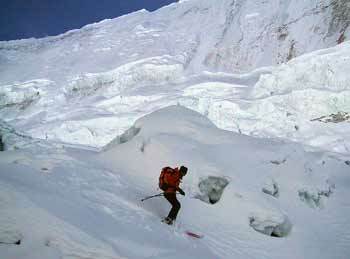 If you were here tonight on the Lhotse Face, you would definitely understand. So we’re comfortable, we’ve got everything we need. The tents are holding up well. But what we’re hoping for tonight  and what everyone at home can pray for us  is that as often happens, the wind dies and we get a break. And the Sherpas will roll out early tomorrow and we’ll go on to the South Col.
Last night I listened to the roar of the wind through the South Col. We need to not hear that tomorrow morning before we go up there. So one step at a time. We’ve got the mountain to ourselves. We’ve got a great team and we’re taking care of ourselves. We’re in touch with Base Camp and even all the way down valley to Pengboche, where we got some much-appreciated best wishes sent up the valley and up the Lhotse Face here tonight. So we’re going to be up actually probably for hours. There’ll be water and brewing and getting ourselves hydrated and keeping our strength up as for a shot at the South Col tomorrow. At 4 am I’ll talk to Base Camp, find out what the Michael Fagin forecast says and much more important will be what we hear and feel here on the Lhotse Face at 7200 meters, preparing to climb higher and to try to summit Everest as soon as the day after tomorrow.